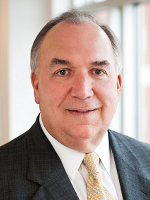 John Engler is president of the Business Roundtable (BRT), an association of chief executive officers of leading U.S. corporations with a combined workforce of nearly 16 million workers and more than $7 trillion in annual revenues. He is a former three-term governor of Michigan. He assumed the leadership of Business Roundtable in January 2011 after serving six years as president and CEO of the National Association of Manufacturers. At the National Association of Manufacturers, he led efforts to encourage high school and college students to study science, technology, education and mathematics (STEM), preparing them for careers in manufacturing. “The Dream It, Do It campaign” also highlighted the rewards choosing mathematics as a career. He graduated from Michigan State University with a bachelor of science in Agricultural Economics. Later, he earned a law degree from Thomas M. Cooley Law School in Lansing, Michigan.